That's the newspaper headline for today's card! How many Sale-A-Bration items do you see on this card? There's three - the Sweet Summer stamp set, the ribbon and the buttons. 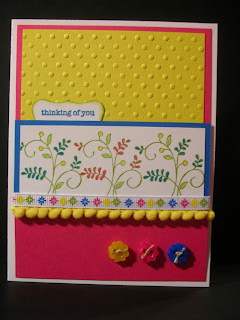 I also incorporated the Daffodil Delight Pompom Trim from the Occasions Mini Catalog. The color combination should brighten someone's day who is feeling down - Melon Mambo, Daffodil Delight, Old Olive and Pacific Point.